I hope there will be no need to dive for cover as I relate my next tale but just in case, do keep your wits about you. 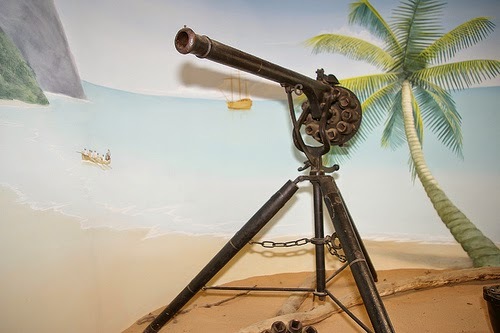 Today we meet James Puckle of London who, on 15th May 1718, filed a patent for the Defence Gun, also known as the Puckle Gun, with the United Kingsom Patent Office. This unusually named weapon was the forerunner of the machine guns we know today but was not quite the success its creator hoped for. Puckle was a writer, lawyer and enthusiastic inventor who had a dream of a gun that could fire not one, not two but several rounds within reloading. He worked tirelessly at his creation until he had proudly compelted the first iteration of the gun, which had its own stand that could fire a maximum of nine rounds per minute. The Defence Gun was a single barrelled flintlock that he envisioned being used on board ships as a means of repelling boarding enemies and could fire a whopping nine rounds per minute, making it, he decided, three times more efficient than an armed soldier. Intriguingly, there were two versions of the gun. The first fired standard bullets and would be used against Christian opponents; the second fired square bullets that Puckle blieved to be more damaging. These would be reserved for use against Turkish Muslims and in their final moments, Puckle decided in his unique way, they would lament the fact that they had not been Christian. In fact the gun was far too complex for gunsmiths to work on and as a result, it was never used in the field. Its very few investors lost their money despite some high-profile backers but Puckle never lost faith in his invention, believing instead that only he had the foresight to see what an amazing innovation this might have been. * Being interested in such things I don't know how I missed this particular weapon. Very interesting. A square projectile would be devastating I imagine . The round ones are bad enough. He was just ahead of his time I guess. I don't think I rad of this gun ever before now . I know, quite an invention!